In our discussion of seasonal effects upon the body, we had previously discussed the effects of spring and had also made mention that as spring progresses, it gets hotter. Continuing this discussion, the system of heat increasing in spring continues until the next season comes upon us, which is summer. Summer brings along certain difficulties, as the heat makes us perspire more. The body tends to start drying, thereby making one’s temperament more inclined to ‘hot and dry’. This, in turn, mobilises the yellow bile humour and consequently many diseases associated to it are noticed, such as diarrhoea, extreme thirst, restlessness, fevers boils, eye infections and eczema, etc. The extremity in heat also affects those people who have a ‘warm to hot’ temperament by making their digestion poorer. 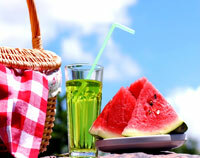 One will notice that in summer, the body craves for moist or liquid type foods more than heavy food items. One will also notice that despite the food intake being less, the stomach feels heavier most of the time. Therefore, one should abstain from such types of food that are heavy to digest, especially sweet, oily and fatty foods. · The body tries to retain some moisture, whereas movement combined with the heat of summer makes the body perspire even more. ·The heat tends to loosen the muscles that would normally be more firm and tight. · Dress lightly in loose fitting clothing. · Drink as much water as possible, as this helps prevent dehydration and also helps the body retain moisture for general mobility. It also aids in adding moisture to help the body remove unwanted matter such as urine and stool etc. · Eat light, easily digestible and cooling foods such as vegetables, rice, sour milk, etc. · Do not eat heavy, very oily, very spicy and very sweet foods, as this weakens and over burdens the already poor digestive system. · If a person craves for such foods, try eating them during cool to cold days after it rains. · Do not eat foods that are ‘hot’ in temperament and nature as this added heat will increase the restlessness and uneasiness caused by the heat of summer. Hence, avoid eating too much of the following: meat, sweet foods, eggs and tea or coffee.